I made this hot crab, spinach and artichoke dip eons ago. And am just now sharing it with you. I’m sorry. You really did need to know about it sooner, because – dip. 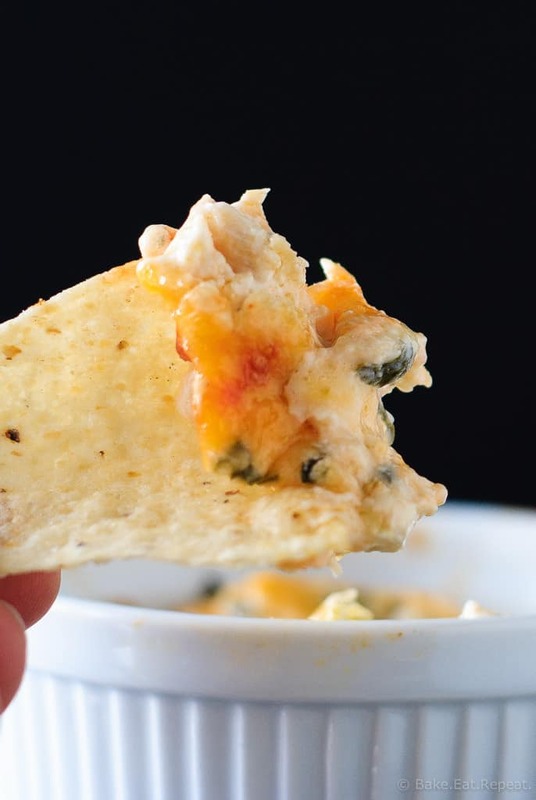 Hot and cheesy and oh so delicious dip. So it’s good that I’m sharing it with you just as bathing suit season gets here. That’s exactly when you want this kind of food! Whatever, there’s always parties, and BBQ’s and Canada Day (or fourth of July!) events to make food for, and dips are always perfect for those types of things! Everyone loves dip – that’s just a fact. Spinach dip has always been one of my favourites, I think pretty much everyone under the sun can say that, but crab dip is even better. It’s one of those things that if I see it on the menu at a restaurant, I pretty much need to convince someone to share it with me. 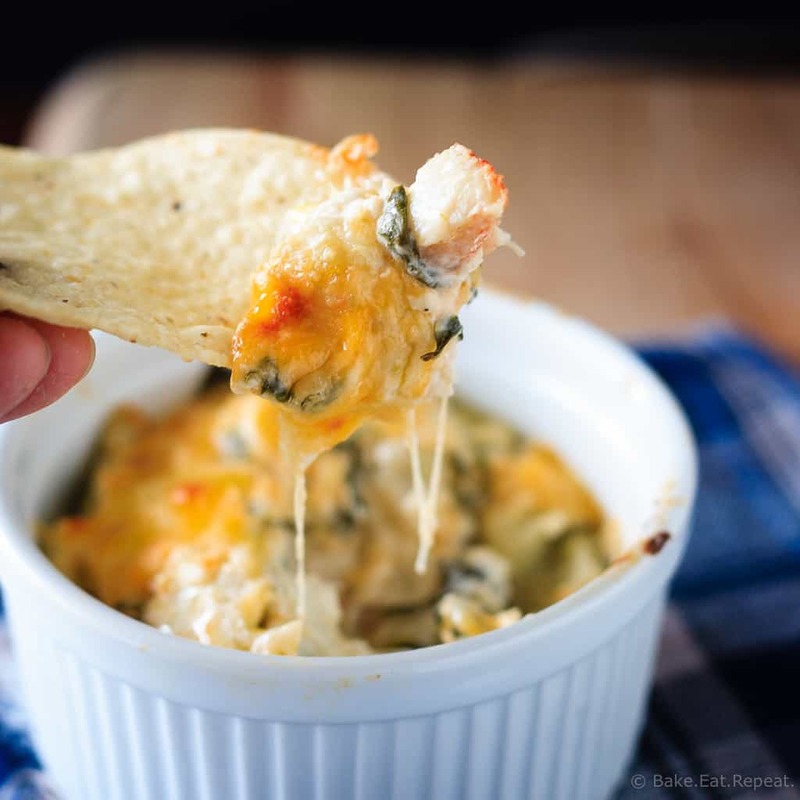 Tossing crab into a hot and cheesy spinach and artichoke dip is pretty much the best thing ever. It makes me forget to worry about calories because it’s totally worth it. Generally I say that about chocolate, not savoury appetizer type food, but there’s always exceptions. And hot baked crab, spinach and artichoke dip definitely falls into that category. This stuff is amazing. It’s probably a bad thing that I discovered how easy it is to make! I guess I’ll just have to work on a lightened up version now. It IS bathing suit season after all! I should probably also note that I did not bake this dip in little ramekins as the pictures would suggest. This dip is actually baked in a 9 inch square baking dish (or another dish of similar size), I just wasn’t really planning on posting it when I made it so I never took any pictures. Then we dove in and ate half of it in record time and I decided I needed to write this one up! So the leftovers were carefully moved to little ramekins to take some photos. As a side note though, that was a great way to store the leftovers for reheating smaller portions at a time, and I think that it would bake just fine in the ramekins in the first place if you prefer to bake it that way. But I haven’t actually tried that so if you do, please let me know how it turns out! 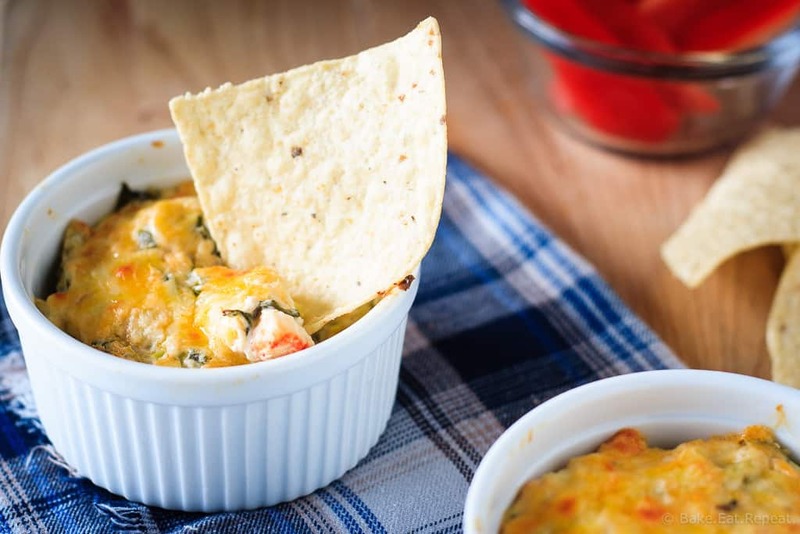 You need to try this amazing crab, spinach and artichoke dip for your next party, or just a regular Friday night. It’s totally worth it, I promise! Note: For the spinach, I used about 3 cups of fresh spinach, and sauteed it for a couple of minutes until it was wilted. Once the liquid was squeezed out of this it was about a cup of cooked spinach. You could also use frozen, thawed spinach, but again, make sure to squeeze out the liquid. Chop the artichoke hearts to whatever size you like, the original recipe called for quartering them, but I found that a little big for my liking so I chopped them up smaller. Preheat the oven to 425 degree F. Lightly spray a 9 inch baking dish with cooking spray and set aside. In a large bowl, mix together the cream cheese, mayonnaise, sour cream and Worcestershire sauce until well combined. Stir in the artichoke hears, crab meat, spinach, green onions, and 1 cup of the cheese. Season with salt and pepper and stir to combine. Spread the mixture in the prepared baking dish and sprinkle the remaining 1/2 cup of cheddar cheese evenly over the top. Bake for 20-25 minutes until hot and bubbling. Serve hot. Store any leftover dip, covered tightly, in the refrigerator for up to one week. Source: Adapted from Damn Delicious . when you say 5 green onions, thinly sliced for the crab,spinach,artichoke dip...do you use the green part as well as the bulb? I do use the whole onions, white and green parts. I just trim off the roots and any wilted parts on the green end and use the rest. The recipe makes a nine inch square dish of dip, so it serves 8-10 people, depending on how much everyone eats. I find with dips that really varies! But if you're serving 8-10 people, that would be about 1/2-3/4 cup of dip per person I think. Oohh, I'm jealous! One of these days I need to get to the East coast just for the seafood! Thanks Erin! Definitely a no brainer to add the crab! :) Thanks Meg! This looks amazing! I love crab as an appetizer. This is definitely my kind of dip!! I am dyyyyyying over the crab in this dip! Genius! Whoa. I need this in my life, like yesterday! YUM! Absolutely addictive. I don't think this dip would be safe with me around! Spinach artichoke dip is my favorite!!! Love the addition of crab - looks so ooey gooey delicious! My favourite too, it's so addictive hey? And adding crab couldn't be a bad thing! Thanks Kelly! That ooey gooey cheese is getting to me. The perfect hearty appetizer or light lunch! wow, sounds like a super awesome dip! love the flavors! I have not made a dip in so long now! I loveeee spinach dip. My husband would adore this - he's such a huge fan of crab! Have a fantastic weekend!! Every time I make dip I think that I need to make it more often! But the kids won't eat it, so I really can't make it unless there's people coming over - it's just far too much for two of us! Although it's also awesome so maybe I shouldn't let that stop me! :) Have a great weekend Ashley! I'm in the MD area just like Medha, so I see a lot of crab dip. Spinach artichoke is my personal fave, so these pics are especially appealing! And I like the ramekins. It's great for portions! Yeah, I kind of wished I had just baked it in the ramekins to begin with - definitely trying that next time! And I often wish I lived somewhere where crab is more prevalent, I just used the canned stuff, but fresh would be so much better! Thanks Mir! Hahaha, well if a vegan thinks it's good it must be right?! Thanks Medha! Spinach and artichoke is one of my favorite dips, so I'm loving the addition of crab! I don't think I could be trusted around this, as I would make this my meal! :) Look delicious! I absolutely did that with some of the leftovers - it's perfectly all right in my mind! :) Thanks Gayle!